A desktop/tablet hybrid; a tabtop? Asus killed it at CES this week with new products like the VivoTab Smart ME400C, the Google TV 3.0 Qube, and the Transformer AiO P1801. The Transformer AiO is one of the most unique computers we at TechRadar have ever seen: a hybrid tablet and desktop with two separate processors. But the strangeness doesn't end there: each of those processors runs a separate operating system, one Windows 8 and the other Android 4.1 Jelly Bean. TechRadar spent a few minutes playing around with Asus's Transformer AiO at CES and checking out its rather unique functionality. The Transformer AiO's base unit packs a third-gen Intel i5 or i7 processor, and it's where the Windows 8 magic takes place. The screen is removable, though, and acts as a tablet when it's not on the base. The tablet portion carries its own Nvidia Tegra 3 and runs Jelly Bean. Alternately, the Intel-powered base unit can stream Windows 8 over Wi-Fi to the tablet. So the tablet can really do either. Each portion has its own storage, as well; the tablet has 8GB of eMMC while the base packs between 500GB and 2TB of hard drive space. The Transformer AiO also features up to 8GB of RAM and an unidentified discrete graphics chip using 1GB of virtual memory, all housed in the tablet. So the tablet can run Jelly Bean totally separate from the base, while the base does nothing on its own - the tablet has to be docked or connected via Wi-Fi to take advantage of the base's Intel chip and kick into Windows 8 mode. The AiO tablet itself is rather massive; an 18.4-inch 10-point multi-touch screen and 2.5kg of bulk make it rather unwieldy. It's more of a couch or kitchen table device than a carry-in-your-bag tablet. That said, its 16:9 1080p IPS display is rather gorgeous in person. 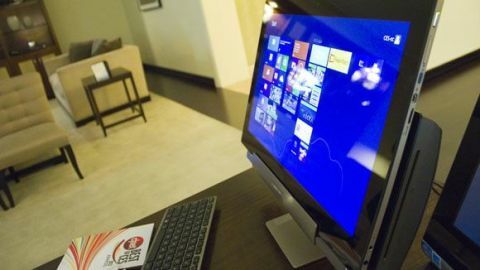 It does feature a few nice usability quirks; a handle lies flush with the top of the tablet's backside and flips out when you need to lift it off or place it on the base unit. Likewise for a stand that makes it possible to prop the tablet up on its own. The base is home to the DVD drive plus four USB ports, an MMC/SD/SDHC card slot, and more. The tablet itself carries its own set of connectors, including a card slot and miniUSB. The included wireless Asus keyboard and mouse are functional, though not exactly anything to write home about. TechRadar experienced no issues using either accessory in both Windows 8 and Jelly Bean modes. The Transformer AiO is certainly an odd duck when it comes to hybrid computers, but with both Windows 8 and Jelly Bean running smoothly it could potentially replace a whole host of other devices in the home. Many people are likely satisfied with just one OS per device, but we have no doubt that someone out there has been dreaming of something like Asus's Transformer AiO for some time. Asus informed TechRadar that the Transformer AiO will be available in Q1 this year starting at $1,299 (UK£805, AU$1,232).